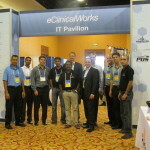 While we are the preferred IT vendor for eClinicalWorks, the top performing EHR platforms and PMs in the medical industry; NetworkAntics’ has been performing consulting for several years with a wide variety of EHRs. As certified experts, we can guide through their implementation process as well as other EMR platforms. Based in San Diego and the Bay Area, California; the majority of our work is on the west coast. However, our nationwide network of trainers, risk assessment advisers, workflow optimizers, and IT consultants can be dispatched within a reasonable amount of time. – Setup and configuration of all network, workstation and server equipment and hardware procurement for local hosted or cloud. – Training, workflow, coding, and operational efficiencies assistance. Initial EHR inquiries with regards to compatible equipment, best practices, and EHR software can be provided for as little $495 on-site review. – Documentation of work performed and risk assessments can be prepared for all stages of “meaningful use” and HIPPA compliance for as little as $1000. Contact the medical office IT support leader today for more ECW and general EHR implementation questions!